Transpek Industry Ltd is in portfolio of Bharat Jayantilal. He is one of the top investors in India. The company belongs to Chemicals sector. As per the Company website it expertise in handling Chlorine and Sulphur, Transpek has indigenously developed process for chlorinated chemicals like Thionyl Chloride and various Acid and Alkyl Chlorides. The corporate office and factory is located in Vadodara Gujarat. It also has wholly owned Subsidiary Transpek Europe with offices in London. On an absolute basis the stock is an multi bagger. It has given close to 75 times return if you consider 2002 prices with current prices. Majority of price appreciation came after year 2014. It was trading in double digits in year 2014 and now is trading in 4 digits. The dividend yield at current market price is .5% which is decent looking at price appreciation the Company had in recent past. Retail investors should wait for correction in this counter after the mega run by the Stock. Transpek Industry Ltd is a Chemicals Company.Chemicals sector saw good growth in recent years. There were many stocks from this sector which performed well on exchanges and made money for the investors. 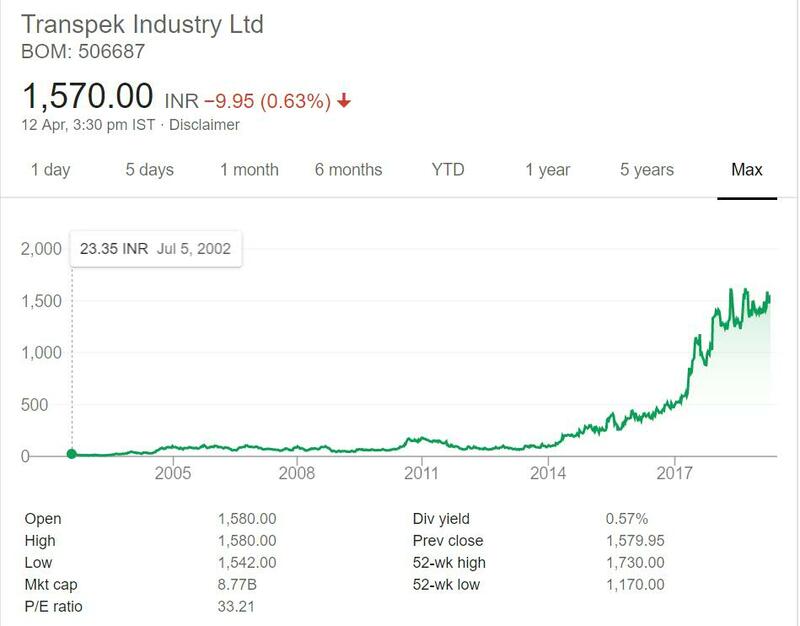 This company has also made money for investors as shown be the long term performance chart above. Chemicals sector have good number of Companies listed. It is also a difficult sector to analyze. Most of the Companies produce some compounds which are used by different industries. The demand of these compounds in different industries drive Sales for the Companies which results in revenue and stock price gain. The best way to analyze a Chemicals company is to analyze the Compounds it creates and application for those in different industries. This will give you an idea of market size and growth Company can have on capacity expansion and market capture. I have already invested in this Sector but not in this stock. I am evaluating this sector in details and may invest in one more Company from the sector. As of now I am not tracking this Company as majority of bull run in the Counter came in last few years.